The wines from Abruzzo became famous world wide in the XVI century, thanks to Princess Margaret of Austria and Farnese has made sure it has kept its high reputation throughout the years. Margaret of Austria and her husband Prince Farnese began producing wines of very high quality that were drunk at feasts all over Europe. Farnese has carried on this tradition with a highly advanced, complete and flawless programme of production and marketing. The Idea is to have the highest expression of the vines of the area that is perfect for vine-growing with low yields and a slight over-ripping. Wine for demanding drinkers, it can combine perfectly great structure, aromatic and taste richness and harmonious elegance. The grapes are handpicked and put in little baskets and carried to the winery, for de-stemming, double hand selection of the gapes and soft crushing, maceration-fermentation for 25 days. Malolactic fermentation and maturation in French and American barriques for about 24 months. This is a smooth wine featuring cedar, lots of pepper, dark cherry, licorice, chocolate, plums, cherry pipe tobacco, mocha, tamarind and arugula on the finish. 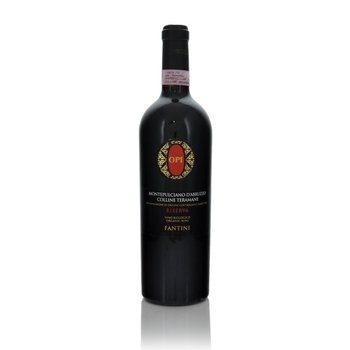 It has a full body with medium to medium+ tannins, good acidity and a long length. Try with succulent braised venision.